Product Description: 100 pounds overweight, loaded up on steroids and suffering from a debilitating autoimmune disease, Joe Cross was at the end of his rope. Tipping the scales at 310 lbs, Joe saw a path laid out before him that wouldn't end well. 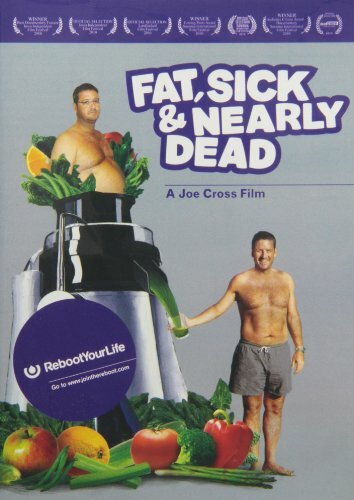 Fat, Sick & Nearly Dead is an inspiring film that chronicles Joe's personal mission to regain his health. With doctors and conventional medicines unable to help long-term, Joe turns to the only option left, the body's ability to heal itself. He trades in the junk food and hits the road with juicer in tow, vowing only to drink fresh fruit and vegetable juice for 60 days. Across 3,000 miles Joe has one goal in mind: to get off his pills and achieve a balanced lifestyle. While talking to more than 500 Americans about food, health and longevity, it's at a truck stop in Arizona where Joe meets a truck driver who suffers from the same rare condition. Phil Staples is morbidly obese weighing in at 429 lbs - a cheeseburger away from a heart-attack. As Joe is reclaiming his life, Phil begins his own epic journey to get well. What emerges is nothing short of amazing - an inspiring tale of healing and human connection. Part road trip, part self-help manifesto, Fat, Sick & Nearly Dead defies the traditional documentary format to present an unconventional and uplifting story of two men from different worlds who each realize that the only person who can save them is themselves.